The UMaine Composites Centre-led team of industry leaders and national laboratories is one of five awardees selected from over 70 competing proposals. In this initial phase, each project will receive up to $4 million to complete the engineering, design and permitting phase of this award. In a year, DOE will select up to three of these projects for follow-on phases that focus on siting, construction and installation, and aim to achieve commercial operation by 2017. These projects will receive up to $47 million each over four years, subject to Congressional appropriations. The United States has tremendous untapped clean energy resources, and it is important for us to develop technologies that will allow us to utilise those resources in ways that are economically viable. Today’s announcement of awards to the first offshore wind projects in the US paves the way to a cleaner, more sustainable and more diverse domestic energy portfolio that develops every source of American energy. The programme, known as Aqua Ventus I, will be a 12 MW demonstration wind park using the VolturnUS floating platform technology developed at the UMaine Composites Centre over the last four years. This project builds on the success of the DeepCwind Consortium Research Programme, spearheaded by UMaine Composites Centre and its industry partners, and funded by DOE, National Science Foundation-Partnerships for Innovation, and the Maine Technology Institute, among others. A 1:8-scale VolturnUS floating platform will be deployed by UMaine researchers in spring 2013 at the UMaine Deepwater Offshore Wind Test Site near Monhegan Island, Maine. UMaine’s Composites Center is partnered with industry leaders who collectively will invest over $40 million in the demonstration project. 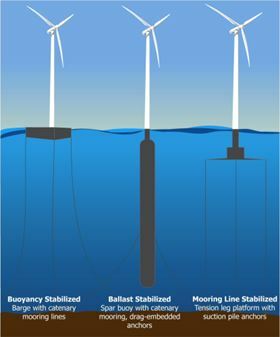 Deepwater (water that is a least 60 m deep) floating offshore wind farms could harness stronger and more consistent winds located beyond the reach of traditional fixed-foundation offshore turbines, while being out of the line of sight from shore. The Gulf of Maine has 156.6 GW of offshore wind potential, the majority of which is in deepwater. Maine has a plan to build a 5000 MW network of floating farms by 2030, which would attract $20 billion of private capital to our state, and create thousands of jobs. The Maine Advanced Structures and Composites Center has received an ‘Innovator of the Year’ award.